Happy Friday! Recently I easily changed my Ikea Karlstad sofa cover from charcoal gray to what I call "Roger Sterling" gray, also know as Isunda (in Ikea language). 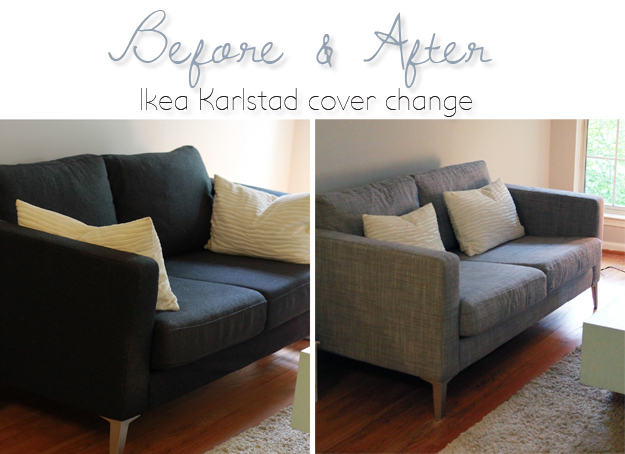 I purchase this Ikea loveseat 3.5 years ago and was ready for an upgrade (but not ready to spend $$$ on a white leather tufted couch, my ultimate desire!). I'm glad I purchased this basic sofa several years ago because at the time I had the foresight that I might want to change the cover some day. The pillows and cushions are easy enough to unzip and slip the new covers on; for the arms and frame, David had to help me turn the sofa over so we could undo the bolts in the back. Simple enough - the rest of it velcroed on. I also bought metal feet instead of using the blocky wooden feet that come with the sofa. I'm impressed and pleased with the change. 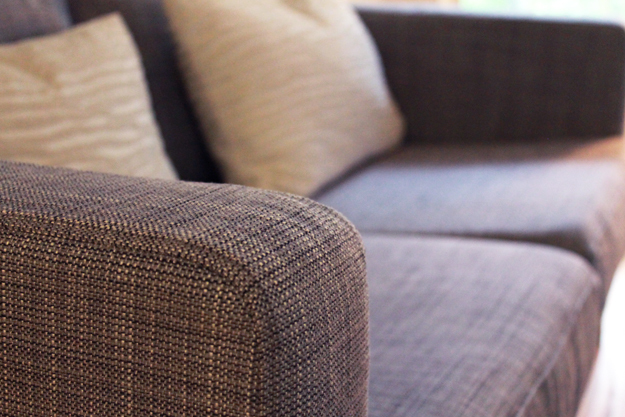 The loveseat cover is an affordable upgrade at $140. Why a loveseat instead of the sofa? - I'm a small person, live in small spaces, and like small furniture. Have a fabulous weekend and thanks so much for stopping by. That looks soo good! I love the style of the couch too! That's one good thing about IKEA... the interchangeable covers! I just refreshed my standard Poang chair with a brand new cushion so it's looks as good as new now! The new color brightens the room and gives it a new look. Ikea is one of my favorite places to shop for accessories and cute statement pieces.